The commercial fishing industry of Cuba is an important source of fishery products originating from the Gulf of Mexico and Caribbean region. Cuba historically fielded a large distant-water fleet that was engaged in the harvest of many worldwide subtropical and temperate pelagic fisheries stocks. Given the evolution in the global political environment of the early 1990s, Cuba’s commercial fishing industry changed dramatically. As a result, production emphasis has shifted from high volume, low-value, pelagic stocks toward high-valued, nearshore fisheries. Cuba has more recently played an increasingly important role in the world market for these high-valued finfish and shellfish seafood products harvested primarily within Cuba’s nearshore waters. As the U.S. seafood industry continues to strive to enhance its competitiveness in the global seafood market and as domestic fisheries managers attempt to be more effective in developing sustainable domestic and regional fishery management policy, a need exists to better understand the role Cuba plays in the total production of seafood products and recognize Cuba’s importance in the world seafood market. And if political change in the region affords the opportunity of renewed trade between the United States and Cuba, an understanding of the resultant market impacts is crucial. In addition, given that the southeast U.S. region, Florida, in particular, and Cuba effectively share the same marine ecosystem, the sustainable utilization of the region’s marine resources may be dependent on a shared understanding of appropriate management strategies. The management structure associated with Cuba’s commercial and recreational fisheries has undergone significant change in the last several years. This paper will thus provide a brief history of the Cuban commercial fishing industry and discuss the recently implemented management structure. The commercial fishing industry of Cuba has long been an important source of fishery products from the Gulf of Mexico and Caribbean region. Prior to the Cuban Revolution, the commercial fishing industry in Cuba was characterized by a fleet composed of small boats and vessels plying the island’s nearshore waters. These craft, which were typically low capacity and technically unsophisticated, primarily targeted a complement of reef fish; spiny lobster; sponge; and a few pelagic finfish species such as mackerels, tunas, and billfish. The landings were handled by small-scale processing facilities and the products were then mostly directed into the local domestic markets and the tourism industry. Following the Revolution, much attention was given to further developing the commercial fishing fleets. A viable modern fishing fleet would not only provide a badly needed source of domestic protein and export revenue, but would also enhance coastal surveillance capabilities, provide training opportunities for naval recruits, and reestablish relations with neighboring Latin American nations via bilateral fishery access agreements. However, the modernization of the Cuban commercial fishing industry would require considerable revenue, which unfortunately was in short supply as a result of production disruptions caused by, among other factors, economic sanctions imposed against Cuba by the United States. During the early 1960s and the next two decades, a modernization program created port facilities that provided for the expansion of the Cuban fishing fleet, the seafood processing sector, and the various commercial fishing service-related industries. The Cuban fleet that emerged from this program was characterized by a level of technical sophistication and capacity unrivaled in the Caribbean and Central American region. Annual commercial fishery landings averaged about 20,000 metric tons (mt) before the Revolution (Food and Agricultural Organization of the United Nations). Following the period of commercial fishing fleet development, landings exceeded 100,000 mt by 1970 and approached 200,000 mt by 1976. Whereas before the Revolution the Cuban commercial fishing fleet was primarily a nearshore fleet, the new Cuban fleet was comprised of four distinct components. • The Flota Cubana de Pesca (FCP) was the distant- water fleet composed of purse seiners and midwater trawlers. This sector of the fleet represented a different form of fishing activity than that in which the Cuban fleet had traditionally engaged. The FCP developed into the largest distant- water fleet in all of Latin America and targeted low-valued species such as mackerels, herrings, and hake. These low-valued fish, harvested from southern and northwest Atlantic and Pacific regions, were destined primarily for the domestic market. • The Flota Atunera de Cuba (FAC) was composed of tuna and swordfish longliners, which operated in the Gulf of Mexico and Mid-Atlantic regions. • The Flota del Golfo (FG) contained bottomlongliners and other hook and line vessels that targeted bottom fish and reef fish in the Campeche Bank and in the nearshore waters. • Finally, the Flota de Platforma (FP) was comprised of nearshore vessels, which possessed a wide variety of gear types such as traps, hook and line, trawls, and gill nets. The FP targeted a complement of high-value, nearshore species such as shrimp, spiny lobster, sponge, reef fish, and crab. The catch of the FCP (the fleet most supported by the preferential trading agreements with the former Soviet Union via advantageous oil prices) was primarily intended for domestic consumption, whereas the high-value catch of the FAC, FG, and FP was destined for lucrative export markets and represented an important source of new export revenue. Although an impressive accomplishment, the development of the modern Cuban commercial fishing fleet was fraught with bad timing. This was particularly true for the FCP, FAC, and FG. Virtually all coastal nations in the Americas imposed 200-mile limits for their territorial waters in the late 1970s. With few exceptions, the exclusive rights claimed by these coastal nations excluded access by all other countries to the fisheries resources found in their territorial seas. With access denied (there were only a few exceptions throughout the region), Cuba was left with a stable of large operationally-costly vessels (FCP), which were then forced into the role of only being able to operate in the even more costly openocean regions. The high cost nature of the fleet, coupled with being forced to target low-valued stocks, produced an economically less efficient operation. As a result, the FCP (which targeted low-valued species) was almost totally dependent on relatively inexpensive Soviet fuel oil in order to stay operational. Such Soviet assistance did allow the FCP to continue operations for a number of years, even as the aging and costly fleet continued by necessity to target low-value species for domestic markets, rather than generating export revenue as was the case for the other fleet components. The breakup of the Soviet Union and the tightening of U.S. embargo regulations against Cuba in the early 1990s caused the virtual shutdown of the FCP and reduced operations of the FAC and FG. Thus, during the first few years immediately following the breakup of the Soviet Union (in Cuba this is referred to as the “special period”) total fleet operations were constrained. In particular, the majority of vessels comprising the FCP were standing idle in Havana harbor. The cost of operation and maintenance, coupled with the lack of fuel, was fatal to FCP fleet operations. A few former FCP trawlers are reportedly being used as transport vessels. Thus, the distant-water fleet Cuban landings of all forms of finfish and shellfish decreased dramatically, with the majority of this decrease associated with reduced operations of the FCP and declines in landings of pelagic species. The vessels, which comprised the former FP, continue to operate in the nearshore waters producing a wide variety of high-valued species, the most important of which are spiny lobster, shrimp, sponge, and reef fish. The FAC and FG also continue to operate and target pelagics such as mackerels, tunas, swordfish, reef fish, and sharks. During 1996, 12 FCP trawlers were yet targeting hake in Canadian waters. A longstanding fisheries agreement with Canada provides access by the Cuban fleet. Thus, the high-valued species harvested by the remaining fleet components, particularly the FP, represent the economic backbone of the commercial fishing industry in Cuba today. 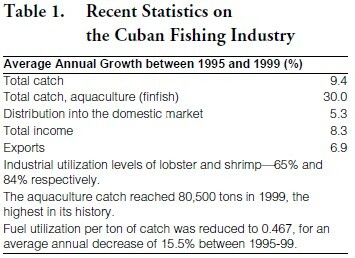 The impact of the economic crisis of the 1990s in Cuba and the impact of the sudden lack of resources with which to maintain the existing fleets, particularly the distant-water fleet, contributed to a situation whereby the landing and processing of seafood products was significantly impaired. During the period from 1992 through 1994, the total volume of fisheries catch declined by 20%, while the volume of seafood exports declined by 8%. The sale of seafood into the domestic market also declined 8%. These symptoms were the result, as well, of various underlying problems, including technical deficiencies in the fleets, organizational problems in the processing sector, stagnation and obsolescence in the shipbuilding sector, and insufficient integration of scientific research into the management process. In response to this situation, a series of measures were instituted in 1995 by the Cuban government and within the fishing sector itself. The measures included organizational changes necessary for Cuba’s integration into the new world economic order, as well as measures designed to improve efficiency in production, commercial activity, and financial management in order to ensure competitiveness of Cuban products in the world market. • Upper level administrative changes. • Establishment of a clear, flexible, and dynamic development strategy for fisheries management. • Implementation of a new organizational structure. • Provide training regarding new management techniques for directors and managerial personnel. • Strengthen the links between the Cuban Ministry of the Fishing Industry (Ministerio de la Industria Pesquera, MIP) and the fisheries productions units. • Imposition of regulatory guidelines to better ensure sustainable development of Cuba’s fisheries. • Decentralization of production and financial management responsibilities. The Ministry of the Fishing Industry (MIP) is the agency in charge of directing, implementing, and governing the policy of the State and Government concerning research on and the conservation, extraction, breeding, processing, and marketing of fishing resources. The former structure of the MIP did not correspond to the new management direction encouraged by the above changes, nor was it compatible with a newly instituted work method and strategy. The myriad of management entities within MIP — the enterprises engaged in fishing, processing, marketing, shipbuilding, export/import, etc. — were organized vertically with ten distinct management levels between the Minister and the actual producers. The large number of subordinate enterprises and the excessive vertical integration complicated and slowed the entire management process. The former structure made the systematic monitoring and controlling of the fishing industry virtually impossible. With the objective of improving economic efficiency and sustainable use of fisheries resources, a change in management focus was applied. Probably the most significant change in the MIP structure was an attempt to decentralize the day-to-day operations of the harvesting sector. The MIP was left in charge of the legal and regulatory activities (i.e., administrative functions, enforcement, stock assessment, etc. ), while the production enterprises were delegated to control most day-to-day productive activities and services. To facilitate the introduction of policy changes aimed at decentralization, a new overall organizational structure was instituted within the MIP. The central idea of the new MIP structure is to incorporate modern entrepreneurial and management techniques via more horizontal and flexible structures — Associations. These Associations were created for the purpose of bringing decision-making and responsibility closer to the point of production, thereby increasing the efficiency of the economic activities (i.e., fleet operations) related to fisheries harvest. A Provincial Fishing Association (PFA) is located within each province, including the Isle of Youth. These PFAs are responsible for producing shellfish and finfish landings in compliance with the species specific harvest plans. These plans are developed by the associations themselves, then consulted and approved with/by the Executive Board of the MIP. The PFAs have independent legal and jurisdictional authority, with independent control over productive resources (i.e., vessels, fuel, supplies, ice, labor, etc.). The PFAs also have control over the number of vessels, as well as ensuring the enforcement of size restrictions, gear restrictions, closed seasons, etc. The other six Associations provide the necessary resources and logistical support for the PFAs. They also assist in feasibility studies of proposed projects with the overall purpose of broadening fisheries market potential, finding new business opportunities, and further developing other activities of common interest. The PFAs have been given an unprecedented amount of autonomy regarding day-to-day operations of the fleet. Recent changes have interjected the notion of “profit maximizing” among vessel captains and crew. For example, each PFA has a target level of annual production for each species. With a fixed annual perunit price per each species, the PFA (which manages a given number of vessels targeting species indigenous to the region) attempts to achieve the harvest objective at the minimum cost possible. The unit price for the target species is set with MIP staff and representatives from each PFA. In the case of the domestic market, the price is set in correspondence with operational costs, qualitative value of the product, and governmental pricing policies. In the case of foreign markets (exports), prices are determined according to costs and international market supply and demand. The Association sells the landings to the enterprises charged with fisheries product commercialization, ACEPEX and INDIPES. Each vessel’s trip expenses (i.e., ice, bait, tackle, etc.) are then covered with the revenue earned from the trip by that vessel (major repairs to the hull and deck equipment are paid for by the PFA). The Association returns the difference between total revenue and trip costs (referred to as “margin”) to the individual vessels. Each vessel’s captain distributes the margin for that trip to the crew via a predetermined share system. The captain uses his discretion to determine the share each crew member receives. Thus, the crew has an incentive to minimize costs such that the net returns back to the vessel, and the crew, is maximized. The crew share is reportedly paid in dollars (20%) and pesos (80%). This process, which applies across all PFAs, is a radical departure from the previous system where the captain and crew members received a fixed annual salary along with perks determined via a complicated and generally ineffective incentive system. Because the margin is the main source of income to the crew, a strong incentive therefore exists to operate the vessels as efficiently as possible. In addition, the price received by the vessel can be a function of quality. So, a high premium is placed on handling the catch such that quality is preserved. This new payment system for the PFAs, referred to as the “Special Working Contract,” is as yet evolving and very much at the trial stage. The FP fleet, which produces the majority of high-value, exportable finfish and shellfish products, is the primary participant is this new program. • Creation of a broader judicial mandate for fisheries management. • Introduction of fisheries licensing procedures for commercial, recreational, and research purposes. • Adoption of measures to protect threatened and endangered marine species such as sea turtles, manatees, and black coral. • Increased monitoring and enforcement of marine resource conservation and coastal water quality measures. • Introduction and enforcement of system of fines and penalties to ensure sustainable use of fisheries resources. The 1996 Decree Law also provided for the establishment of the Advisory Commission on Fishing, which consults with the Minister on issues related to administration, organization, and rational use of coastal fisheries resources. Recent measures established by the Commission address creation of protected areas, species-specific closed seasons, minimum legal sizes for given species, prohibition of retention of potentially toxic species, recreational fishing quotas, gear restrictions, licensing/authorization guidelines, and sanitary/health regulations for processors. To ensure regulatory control and compliance with these measures, the MIP created the National Office for Fishing Inspection (ONIP), whose mission is to enforce the conservation and rational use of aquatic resources within Cuba’s commercial zone, territorial seas, and inland waters. The ONIP utilizes 15 Provincial Offices for Fishing Inspection, with over 200 inspectors and specialists distributed on the basis of the economic importance of fishing among the provinces. The adoption of the 1996 Decree Law, formation of the Advisory Commission on Fishing, restructuring of the MIP, creation of the Provincial Fishing Associations, and implementation of the “Special Working Contract” has reportedly resulted in a increased landings, improvement in the operational efficiency of the fleets, enhancement of the distribution of seafood products into the domestic market, and increased export revenues derived from seafood (Table 1). During the 1996-1999 period, total landings increased by 9.4%, seafood distributions to the domestic market by 5.3%, and exports by 6.9%. In addition, fuel utilized by fishing vessels per ton of catch was reduced from 0.9 tons to 0.5 tons, thus providing evidence that incentives to minimize operational costs have succeeded. The advances made since the advent of the “Special Period” demonstrate not only that the strategies adopted were effective, but that it is possible for a state enterprise to come back from the point of crisis. The Cuban fishing industry, an important source of high-valued tropical seafood for the world market, has experienced considerable change during the last decade. In an attempt to enhance the economic efficiency of the industry, the Ministry of the Fishing Industry has been substantially restructured. A key goal of this restructuring process is to decentralize the fleet management process, thereby providing incentives for vessel operations to minimize costs, enhance production, and increase revenues generated by the commercial fishing fleets. Since 1995, total fisheries catch has increased 9.4%, total income derived from fishing has increased 8.3%, and seafood exports have increased 6.9%. Adams, C.M. An Overview of the Cuban Commercial Fishing Industry and Implications to the Florida Seafood Industry of Renewed Trade. IW98-3. International Agricultural Trade and Development Center, Food and Resource Economics Department. University of Florida. Gainesville, FL. 1998. Food and Agricultural Organization of the United Nations. Yearbook of Fishery Statistics: Landings and Catches. Rome (various years). Food and Agricultural Organization of the United Nations. Yearbook of Fishery Statistics: Commodities. Rome (various years). García, A. Unpublished descriptive information on the Cuban fisheries industry. Centro de Investigaciones de la Economía Internacional, Universidad de la Habana. Habana, Cuba. 1996. García, A. and P. Sánchez. “Cambios recientes en la industria pesquera cubana: Su contribución a la eficiencia.” Paper presented at the seminar Role of the Agricultural Sector in Cuba’s Integration into the Global Economy and Its Future Economic Structures: Implications for Florida and U.S. Agriculture, Washington, D.C., 1998. Ministerio de la Industria Pesquera (MIP). Unpublished landings data for various years. La Habana, Cuba. 1. This paper is drawn from a more comprehensive report prepared by Chuck Adams, Plácido Sánchez Vega of the Cuban Ministry of Fishing Industries and Anicia García Alvarez of the Center for the Study of the Cuban Economy at the University of Havana, which was jointly presented at the meetings of the International Institute of Fisheries Economics and Trade in Corvalis, Oregon, in July, 2000.